There are 48 million school children who are served by school food services in the United States everyday. Many of these children participate in the National School Lunch Program (NSLP), which was established by Congress in 1946 to provide low-cost or free nutritionally sound lunches to public school children. By 1946, about 7.1 million children were being served. This grew to 22 million by 1970, and by 2000 more than 27.4 million children were fed through the NSLP. Since 1946 more than 180 billion lunches have been served. School food service and the NSLP play a very important role in children's learning. The NSLP is administered by the Food and Nutrition Service of the U.S. Department of Agriculture (USDA) at the federal level and by state educational agencies at the local level. Most school districts have a food service or child nutrition service director who oversees the work of cafeteria managers and staff in individual school cafeterias. In many school districts, meals are prepared from scratch by kitchen staff, while many districts contract commercial caterers to provide the food. Fast-food companies are also competing to get into school cafeterias. School districts that participate in the NSLP receive cash subsidies and food commodities from the USDA. They serve lunches to eligible students (who may receive the meals free or at a reduced price) and are then reimbursed for the meals. 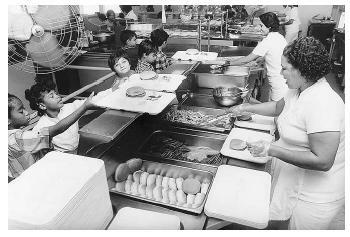 In addition to the NSLP, the School Breakfast Program (SBP) was begun in 1966. By 2001, 7.7 million students were served free or reduced-price breakfasts through the SBP. Children from families with incomes at or below 130 percent of the poverty level (as described by the U.S. Department of Health and Human Service) are eligible for free meals. Those from families with incomes between 130 and 185 percent of the poverty level are eligible for reducedpriced meals. Usually these children pay no more than forty cents for lunch and thirty cents for breakfast. School food-service programs must operate their business as nonprofit programs. To qualify for federal reimbursements, school lunches must meet the Dietary Guidelines for Americans (DGAs) which recommend that no more than 30 percent of an individual's total caloric intake come from fat , and no more than 10 percent from saturated fat . 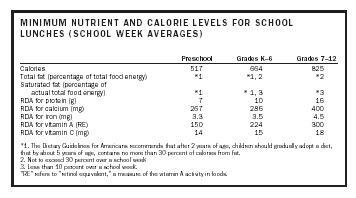 Federal regulations also mandate that school lunches provide one-third of the Recommended Dietary Allowance (RDA) for protein , vitamin A, vitamin C, iron , calcium , and calories . The SBP provides breakfasts that meet the Dietary Guidelines for Americans, and provide one-fourth of the RDA for the above nutrients . RDAs vary for children of different ages. Elementary schools, middle schools, and high schools should therefore serve meals that meet the age-appropriate RDAs. Table 1 shows the school lunches that meet the RDA requirements of children at different grade levels. With the help of the American School Food Service Association, school cafeterias around the nation provide balanced meals, which are crucial to growing children's bodies and minds. Children do not always eat everything on their lunch or breakfast trays. While the USDA attempts to mandate compliance in nutrition integrity of meals provided by school food service, there is no guarantee that children will actually consume everything. G. Richard Jansen and Judson M. Harper, in their 1978 study of the consumption and plate waste of food in the NSLP of fifty-eight elementary schools and high schools, reported that of the 23,000 lunches measured, students tended not to eat all items in the meals. High school students tended to waste less food than elementary students. In 2001, Shanklin found that while students chose meals that were healthful, many did not finish their meals. Vegetables were the least popular item in the meals. While 64 percent of the students selected green peas, most of the students discarded half of what they chose. The issue of plate waste is an important one. Parents and teachers may help by educating students about nutrition and the importance of eating healthful meals, while school-food service personnel can strive to offer nutritious choices in ways that students will find more appealing. According to the USDA, competitive foods are foods "sold to children in food service areas during meal periods in competition with the federal meal programs." The USDA divides competitive foods into two categories. The first is foods of minimal nutritional value (FMNV). USDA regulations prohibit the sale of FMNV in school-food service areas during mealtimes. FMVN include carbonated drinks (such as sweetened soft drinks), chewing gum, and candy. These items may be sold in other areas at anytime during the school day. States and local school districts may have their own restrictions on the sale of FMNV. *1. The Dietary Guidelines for Americans recommends that after 2 years of age, children should gradually adopt a diet, that by about 5 years of age, contains no more than 30 percent of calories from fat. 3. Less than 10 percent over a school week. "RE" refers to "retinol equivalent," a measure of the vitamin A activity in foods. second servings of foods from the NSLP, a la carte items, and other foods and beverages from vending machines, school stores, or snack bars that students buy in addition to or in place of the NSLP. FMNV items include snacks that are high in fat and sugar, as well as sodas, which are dense with empty calories. Most of these items are offered in vending machines, snack bars, school stores, and sometimes as fund raisers that occur during mealtimes at school. These foods have certain characteristics. First, they have minimal nutritional value and have no regulated nutrition standards. Second, these foods usually contain high amounts of fat, calories, and sugar. In many schools, the lunch period does not offer sufficient time for students to stand in line, get their food and to eat it. In cases where lines are long at the school cafeteria, many students choose to buy snacks from vending machines. Often students spend all their lunch money in the vending machines before they get to the cafeteria. School food service (SFS) personnel face many problems when it comes to providing quality service to children. For one thing, they are not allowed to make a profit. Yet, they have to compete with commercial food caterers for staff and customers. They also have to provide meals that are appealing, low cost, and that follow the DGA and federal regulations for RDAs in order to qualify for reimbursements for free and reduced-price lunches. While most parents do not mind giving their children as much as five dollars to spend at fast-food restaurants, they complain about spending $2.75 for a well-prepared nutritious school meal for their children. SFS personnel have to please the school administrators, parents, teachers, children, and the public in order to be successful. The public is often not aware that cafeteria workers work very hard, often get no benefits because most of them are part-time workers, get paid less than their counterparts in commercial operations, and do not get much appreciation for their work. Strangely, many cafeteria workers remain in their jobs for long periods. Many of America's school cafeterias are staffed by dedicated individuals who love children. The American School Food Service Association maintains that their mission goes beyond traditional school meal programs to better their schools and communities. They are committed to the health and well-being of the children served by their programs. SEE ALSO Adolescent Nutrition ; School-Aged Children, Diet of . Jansen, G. R. and Harper, J. M. (1978). "Consumption and Plate Waste of Menu Items Served in the National School Lunch Program." Journal of the American Dietetic Association 73 (4), 395–400. Shanklin, C. "Kids Choose Healthy Lunches, But Don't Eat Them." Journal of the American Dietetic Association 101, 1060–1063.